Why would a Peruvian grilled chicken recipe have soy sauce? Peru has hosted a large Japanese expatriate population since the late 1800s, and over the years Asian flavors mingled with local and European flavors to create one of the most diverse cuisines in the world. I didn’t know this when I lived in South America in the early 1990s. While living in Colombia I did have big plans to visit Peru, Brazil, Chile, and Argentina but simply ran out of time in my two short years there, though I did make it to Ecuador a couple times. I still hold out hope that someday I’ll go back to travel in the region and enjoy the local cuisines. 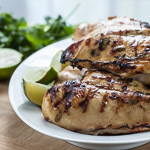 This grilled chicken is simple to prepare and has big payoffs in flavor. I leave it in the marinade for up to 24 hours then grill and serve with whatever vegetables are on the menu or use it for sandwiches or salad toppers. The marinade helps keep the chicken moist as it cooks, and it always finishes nice and juicy. 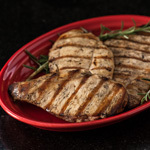 I’ve given directions for cooking on a grill pan with boneless chicken breasts, and the Variations includes directions for cooking on gas and charcoal grills and in the oven. I cooked this chicken on the Scanpan I reviewed, and today is the last day for the Scanpan giveaway. Make sure you enter before 9 pm EST, just leave a comment on the Scanpan giveaway post about your favorite grilling food. Only comments at the original giveaway post will be entered. MARINATE: Whisk together soy sauce, lime juice, garlic, cumin, paprika, oregano, pepper, and oil. Put chicken in a large sealable bag and add marinade. Seal the bag and marinate in the refrigerator 8 to 24 hours. Discard the marinade, then pat chicken dry. Preheat the grill pan over medium-high and add the chicken. Place the chicken pieces on the pan, cooking 7 to 10 minutes per side (less if they are boneless or very thin), turning once. Squeeze lime juice over the chicken and serve. The chicken can be cooked on a grill, grill pan, or in the oven. GAS GRILL: Preheat the grill on high. Oil the grill rack and grill the chicken over a turned-off burner, skin side down and covered. Turn once after about 15 minutes and grill until cooked through, about 30 to 35 minutes. CHARCOAL GRILL: Open vents on bottom and lid of grill. Light a large chimney starter full of charcoal (preferably hardwood). When coals are lit, dump them out along opposite sides of bottom rack, leaving a space free of coals (the size of the quartered chicken) in middle. When you can hold your hand 5 inches above the grill rack directly over coals for 3 to 4 seconds, coals will be medium-hot. Oil the grill rack, then grill chicken over the area with no coals. Turn once after about 15 minutes, and continue grilling until cooked through, about 30 to 35 minutes. Add more charcoal to maintain heat. OVEN: Roast the chicken quarters in middle of a 500°F/260° C oven in a 13- by 9-inch roasting pan with 1 cup water for 30 minutes. Then tent with foil and roast until brown and cooked through, about 15 minutes more. The Peruvians also make a great friend rice! I remember when I traveling there, I was surprised to see so much “Chinos” rice. It really is a part of the cuisine. And that marinade looks great. My favorite grilled recipe? I love satays. Now I’ll have to ask my husband, who recently traveled in Peru, whether he had any Japanese-inspired food there. I don’t recall him mentioning it. But this Peruvian chicken looks wonderful, just the kind of dish we both love. And with our grill right outside the kitchen door, we venture out into the snow to grill all year long! Sounds delicious. I love all the interesting flavors here. Fantastic photos, Andrea! It looks wonderful! Interesting combination of flavors! I can see it working, though. What if you don’t have low sodium soy sauce? Hi Julia, I have a recipe for Peruvian rice somewhere in my files. I’ll find it and share at some point. Lydia, I’m so eager to visit Peru! Nate, the low sodium soy sauce is one of my changes. I think regular soy sauce makes marinated meats taste overly salty, especially if they stay in the liquid for a long time, and I don’t want to detract from the other flavors in the marinade. I never knew Peru had a Japanese community, I’ve learnt something new! I love the simplicity of this dish and I bet it’s packed with flavour too. Epicurious heralded Peruvian food as one of the things to watch for 2009 but I had no idea it was so accessible. And how cool that you lived in South America! You have done it again it looks fabulous. I would love to try this. Brazil also has a large Japanese culture. I love to see how it merges with South American Food. Sounds delish and very versatile…can’t wait to try it! This looks delicious, you can’t go wrong with grilled chicken! how interesting how cultures and flavors can sometimes become “borderless”. 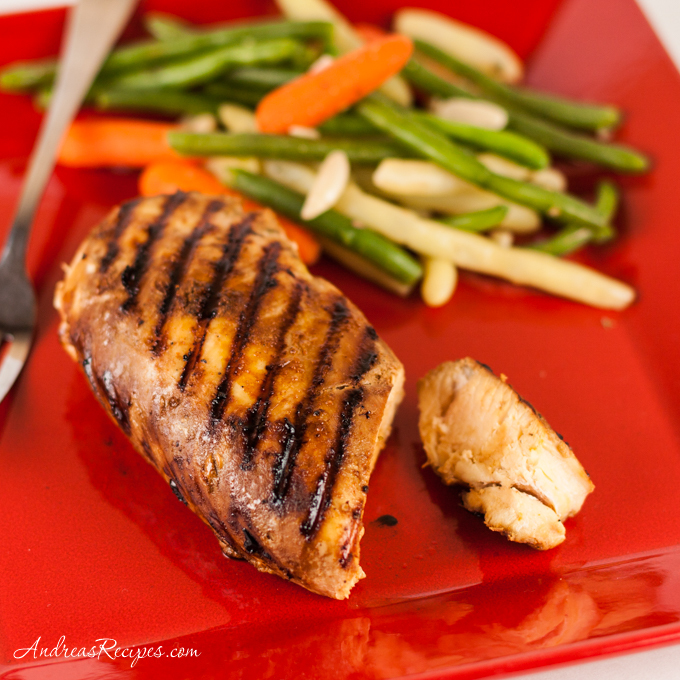 I have to disagree w/ commenter sara – you can easily go wrong w/ grilled chicken! especially boneless and skinnless. but this marinade makes me reconsider ever making boneless/skinless chicken again. it really looks super flavorful – going to have to try this! I saw this recipe in the Potomac News last week and I am planning to make it tonight. I think it’s going to be a good one. Did you know that if you Google “Peruvian Chicken” yours is the first link that comes up?